Dr. Yucel is the best dentist I've ever visited. She was professional, informative and caring. I would recommend ANYONEto her! Dr. Yucel is a real professional, and a very skilled dentist. I have been going to her office for over tenyears, and she has always gone out of her way to make her patients feel comfortable. Dr. Yucel is a real professional, and a very skilled dentist. I have been going to her office for over ten years, and she has always gone out of her wayto make her patients feel comfortable. *Dr. Yucel is a out of network provider for Anthem Blue Cross Blue Shield and UnitedHealthcare, however she will file on your behalf* Nil Yücel, DDS opened her own office in January 2002. Tracing the path that led her to dentistry, she recalls, “As a child I did lots of drawings. I had a thing for beauty and aesthetics. One day in a dentist’s chair, I admired the person working and thought, ‘I would be good as a dentist,’ and it just stuck with me. 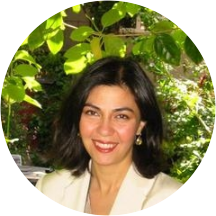 Dr. Yücel, a native of Turkey, received her license in general dentistry from Aegean University in Izmir in 1993 and went directly to Holland where she had been an exchange student before. She did research at the Dental School of Katholieke Universiteit, Nijmegen, as well as treating patients. In August 1994, Dr. Yücel decided to move to California; one of the best places to practice dentistry, and to be near her sisters who currently reside in California. Over the next two years she passed the California licensing exams, then went to UCSF for a two-year post-graduate residency in the AEGD program. There she had the opportunity to work with dental specialists and highly compromised patients. For a year she did research at UCSF in Preventative & Restorative Dental Science. Dr Yücel is an Assistant Adjunct Professor and has published a paper in Surface Sciences on imaging dental collagen fibrils using Atomic Force Microscopy. "Besides doing beautiful, quality work, I do welcome and like open communication.Patients know I care about how they feel that I want to help them move beyond their fear of dentistry. Almost all my patients end up falling asleep, without nitrous, during their treatment.” Dr. Yücel enjoys oil painting, and travel. She’s married and has a beautiful daughter, Ela and a son Jonas. Excellent, friendly doctor. Willing to take her time - did not rush at all. Knowledgeable and kind. Everything was great. Dr Yucel was very communicative and explained everything as she worked and answered my questions. Things in the office were a little confused. I think maybe they were training a new employee or something. Nothing serious at all. She is the most honest and caring dentist that I have ever visited. Thorough, informative and caring. Exactly what you want in a dentist. Great experience from moment I walked in.